Report examines disaffiliation of young Catholics from church. BALTIMORE (January 17, 2018) – Saint Mary’s Press Catholic Research Group and The Center for Applied Research in the Apostolate at Georgetown University (CARA) have unveiled the results of an unprecedented two-year national study on why young people are leaving the Catholic Church. 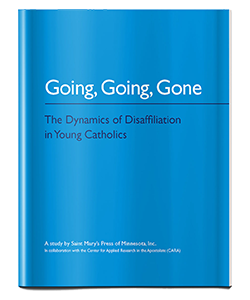 The comprehensive report, Going, Going, Gone: The Dynamics of Disaffiliation in Young Catholics, offers compelling and sometimes disturbing insight into the reasons young people are leaving the Catholic Church and religion in general, said Saint Mary’s Press president and CEO John Vitek. The findings were released at a symposium at the Maritime Conference Center in Baltimore, hosted by Saint Mary’s Press. More than 250 people gathered to hear a nondenominational discussion about the findings. Two days of discussion with nearly 65 national leaders in the Catholic Church followed the symposium. Vitek hopes the church can embrace and seriously reflect on the truthfulness and candor in these stories in a way that helps the church come up with meaningful solutions to keep young people engaged. Saint Mary’s Press, which is based in Winona, Minnesota, and celebrates its 75th anniversary this year, is known for producing educational content for Catholic youth. Vitek said that he and his team were compelled to find out more about why young Catholics leave the church following the Pew Research Center findings in May 2015 about the growth of the “Nones,” people who don’t affiliate with any religion. Of all the major denominations, Catholicism has experienced the greatest net losses as a result of affiliation changes. The Saint Mary’s Press/CARA study found that the largest demographic of disaffiliated Catholic youth claim no religious affiliation. When asked at what age they no longer identified themselves as Catholic, 74 percent of the sample said between the ages of 10 and 20, with the median age being 13 years old. The study found that disaffiliation is a process that happens over time for young people, typically prompted by a series of events or unresolved questions that accumulate over time. The report stated that many disaffiliated youth believe in what Jesus taught, but they perceive organized religion as having corrupted Jesus’ fundamental teachings. They see the church’s dogmas and doctrines as nonsensical, and they believe they can live more moral lives without the baggage of religion. Many perceive that religion was forced on them, and they report feeling freer and happier without what they experience as the burden of religion. Vitek said that Saint Mary’s Press will continue to advocate for the voice of youth in the Catholic Church by continuing to collect and share personal stories through their research web site https://catholicresearch.smp.org/. Saint Mary’s Press and The Center for Applied Research in the Apostolate interviewed 204 of the 5.4 million individuals in the United States who are former Catholics between the ages of 15 and 25. Interviews were conducted September 10–23, 2015. The report has a margin of sampling error of +/- 6.86 percentage points, considered a statistically sound sample. 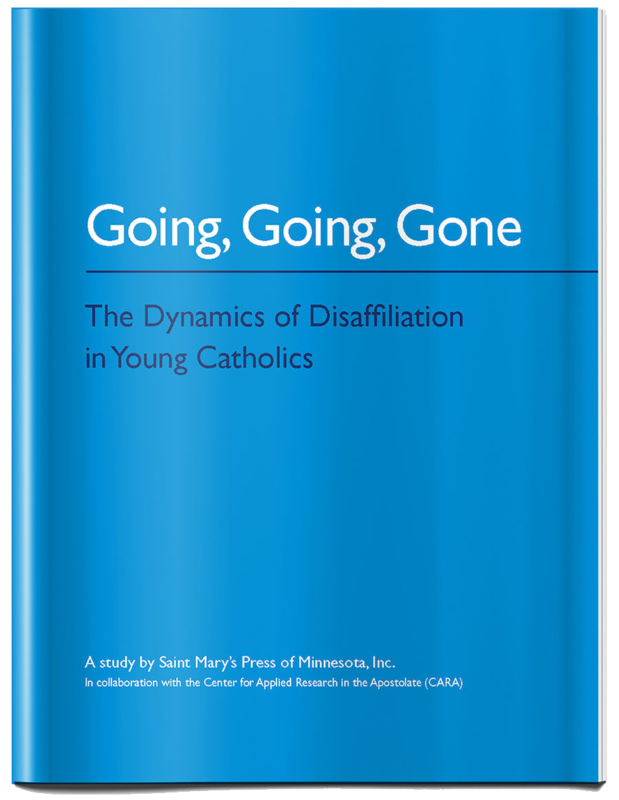 The full report Going, Going, Gone: The Dynamics of Disaffiliation in Young Catholics is available at www.smp.org/product/5926/Going-Going-Gone. Saint Mary’s Press is a nonprofit publishing partner to Catholic schools, parishes, and families, providing human and Christian educational resources for youth. Founded in 1943 by the De La Salle Christian Brothers, Saint Mary’s Press is committed to touching young people’s hearts and sharing the Good News of Jesus Christ in an engaging way that is relevant to pre-K to 12th grade students.